If you've ever dreamed of living in a galaxy far, far away, you'll love this amazing Star Wars home in South Korea. 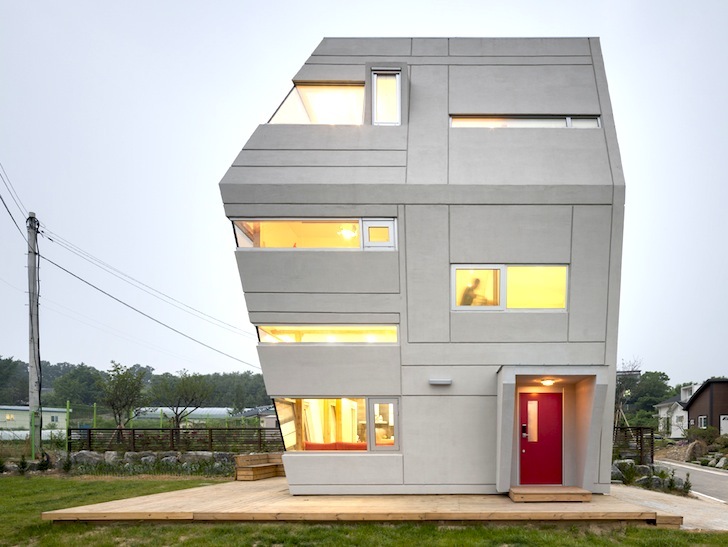 Designed by the Korean architecture firm Moon Hoon, this asymmetric Sandcrawler-like house looks like something straight out of George Lucas' epic space opera. 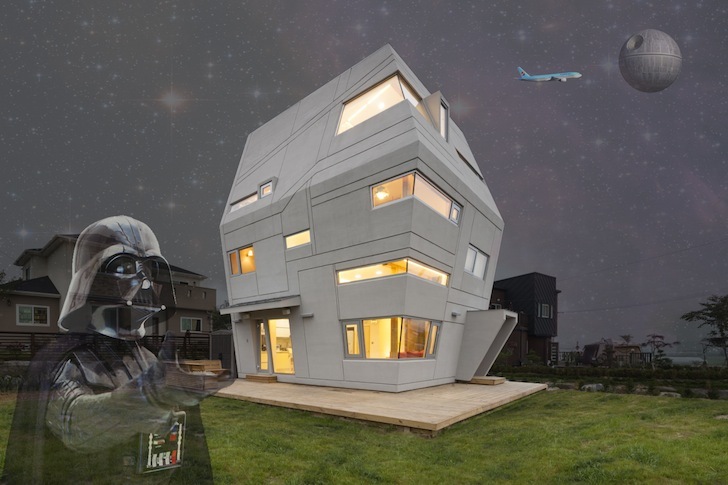 Clad in concrete with beveled grooves, the Star Wars home was built for a young family in the Yongin suburb. The compact, Death Star-colored house makes the most of its limited footprint with its rhombus shape and inclined walls that slope outwards at its midsection. The first two floors house the main living quarters and amenities, whereas the top floor is reserved for a spacious children’s playroom. Horizontally banded windows give the house its spaceship aesthetic and open the building up to natural light and views of surrounding mountains. In contrast to its futuristic exterior, the inside of the Star Wars House is more demure with a simple palette of untreated wood and white walls. A central atrium and skylight channels light down through the center of the house. Moon Hoon also embeds a few playful elements throughout the interior such as a sliding bookcase that doubles as a secret doorway and a slide between two floors. Moon Hoon's playful rendering for the house shows Darth Vader. The compact, Death Star-colored house makes the most of its limited footprint with its rhombus shape and inclined walls that slope outwards at its midsection. The first two floors house the main living quarters and amenities, whereas the top floor is reserved for a spacious children's playroom. Horizontally banded windows give the house its spaceship aesthetic and open the building up to natural light and views of surrounding mountains. In contrast to its futuristic exterior, the inside of the Star Wars House is more demure with a simple palette of untreated wood and white walls. A central atrium and skylight channels light down through the center of the house. Moon Hoon also embeds a few playful elements throughout the interior such as a sliding bookcase that doubles as a secret doorway and a slide between two floors. The house was completed for USD $200,000.